Duni is creating a new organization based around five business areas with the aim of focusing on profitable growth. The goal is increased customer focus and market segment specialization within the new business areas. “Duni has created very strong positions on the traditional restaurant market in Europe over the past few decades. However, growth in this market has been low for several years,” says Thomas Gustafsson, CEO, Duni. Table Top, which will target traditional restaurants primarily in Europe. The Business Area Director Table Top is Maria Wahlgren. Meal Service, which will target the growing fast food segment in Europe. The Business Area Director Meal Service is Linus Lemark. New Markets, which will be active on fast-growing geographic markets outside of Europe. The Business Area Director New Markets is Patrik Söderstjerna. The current Consumer business area, which targets the consumer market primarily in Europe, will remain unchanged. The Materials and Services business area consists of all sales that do not fall under the other business areas. This business area will primarily include external sales of tissue, where Duni previously decided to phase out its hygiene sales during the first quarter of 2015. Hygiene sales represented roughly 90% of Materials and Services in 2013. As a consequence of the new organization, the financial statements will be affected in that income and expenses and assets and liabilities will be broken down into the new segments starting in 2014. However, Duni's consolidated numbers will not change. The financial information for 2013 will be recalculated and reported in conjunction with the interim report for Q1. Table Top - market: Traditional restaurants, primarily in Europe. 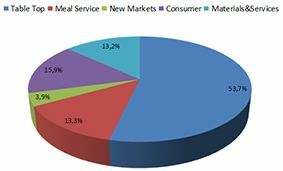 Meal Service - market: Fast food, cafés, take-away, primarily in Europe. New Markets - market: New markets outside of Europe. Consumer - market: Consumer market, primarily in Europe. Materials and Services - primarily production of the tissue paper Duni uses for its own products as well as the production of hygiene products, which is being phased out.